The new WuTech H-469TV photodiode array (PDA) performance is very similar to the previous PDA used in Neuroplex. However, using surface mount technology and low power consumption components the entire circuitry of the H-469III (The diode array, first and second stage amplifiers and multiplexer) now fits inside one box. This new arrangement eliminates the need for an amplifier rack and the heavy cable bundles used with NeuroPlex. Thus the new system is much more compact, much lighter and easier to handle and ship. Moreover, it is much more reliable and easier to operate as problems like 60 Hz line noise, oscillations and ground loops are eliminated. Up to 17 bits (100 db); the system can record signals as small as 10-5 of the resting light level. 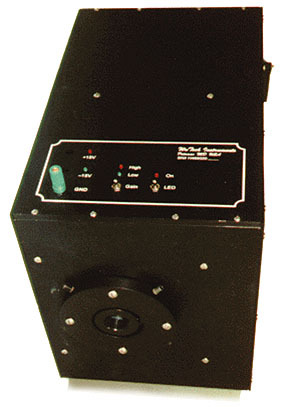 The phototdiode array system was designed for high speed data acquisition: 0.9 msec per frame (including 464 diodes and 8 electrodes). The user can sample a subset of the array to further increase the frame rate. Low, close to the Johnson noise of a 1 G-ohm resistor. Near optimal signal-to-noise ratio for a broad range of light levels. Silicon diodes have quantum efficiencies near 1.0. Unlike a CCD camera, the photodiodes do not saturate at light intensities achieved in neurobiological experiments. Base-line subtraction (AC coupling) in individual channels offers an effective A-to-D resolution of more than 20 bits with the 12 bit A-to-D converter. Neurobiologists typically analyze voltages using electrodes. The software includes the data format that neurobiologists are used to analyzing - wave forms over time for each photodiode input. NeuroPlex also creates pseudo-color images and "movies". Further, the system provides 8 BNC inputs that are sampled and displayed with the photodiode data. A mouse driven point-and-click interface is provided which shows multiple views of the data for clarity and simplicity. Reasonably comprehensive analysis capability is provided. 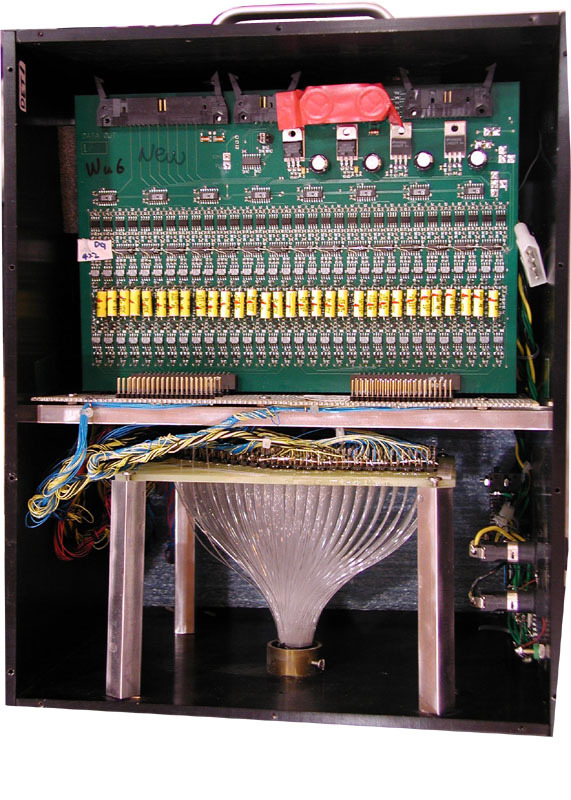 Includes all the necessary components from the photodiode array through the data acquisition and processing unit (diode array, amplifiers, multiplexers, analogue-to-digital converter, computer, and output control panel). 2. Triggered by an external event. 3. Triggered by an event recorded on one of the 472 channels.